Andrew Borg-Cardona was in the courtroom today when Matthew Caruana Galizia testified about his memories of the day his mother was assassinated in a car-bomb. I was in Court today for the compilation of evidence proceedings concerning the alleged murderers of Daphne Caruana Galizia. I don’t normally attend these sort of cases, it’s not my area of law, but for obvious reasons, giving some moral support, to the extent that I can, is sometimes important. Today was one of those days: Matthew Caruana Galizia was due to testify. As always, the proceedings concerned themselves not only with this witness, we had some pretty frustrating arguments about some data or other that Vodafone was to produce and had some difficulty doing, but in the greater scheme of things, this was an issue of great insignificance. When, finally, Matthew (I can call him by his name, he’s only my son’s age) took the stand, Insp. Arnaud took him through the fateful day’s events. You can read the various summaries in other portals, my task today is to try, probably poorly, to describe the atmosphere, an aspect that is of no legal interest but which needs to be put out there. Because, let us not forget, we’re talking here about a young man describing the day his mother was brutally murdered within a couple of hundred metres from the family home. This was as close as we’re ever going to get to an eyewitness account of what happened, and I believe that people out there need to be reminded just what it is that went down on 16th October 2017, at about 3 pm, in Bidnija, limits of Mosta. Testifying in English, Matthew recounted the mundane facts of how the day went up to just before 3 pm when the mundane became the horrific, the unthinkable. He told the Court how on hearing the explosion, he rushed out, trying to keep the family dogs from following him. He told the Court how the road, nearby trees, vegetation in nearby fields were on fire, of the growing horror of his realisation that this was his mother’s car and of seeing human remains. It is almost trite to say that the Court was silent throughout this: only the family and some members of the press and some friends were inside anyway, apart from the participants in the process. It is equally trite to say that many of us had tears in their eyes, listening to Matthew’s account of the day when his world and his family’s world had been brought crashing down. It is necessary, though, to say these things and to emphasise how – without wishing to give him cause to blush – Matthew conducted himself with dignity and strength. 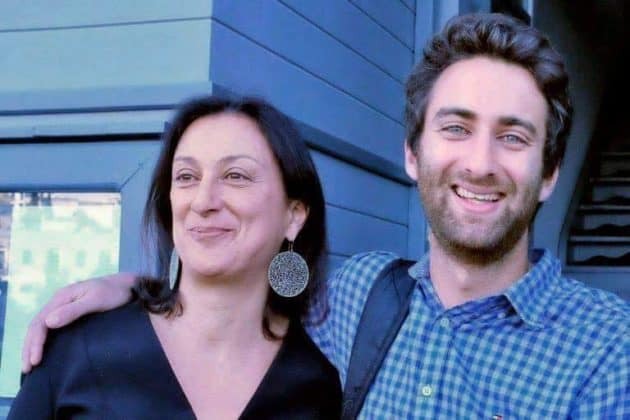 This comes as no surprise to anyone who has seen the way he and his brothers and their father, as well as the rest of Daphne Caruana Galizia’s family, have acted through this year and more of strain, a year and more of vicious insult and of vile insinuations from Labour’s trolls, encouraged by the disgusting antics described so well in this portal and TheShiftNews.com and, sometimes, in other areas of the media. The silence of the Courtroom was broken, justifiably, when defence questions on the lines of “why did you park the car outside the gate?” and “why was ‘the laptop’ given to the German police?” were put. The Magistrate immediately stamped down on this line of questions, but not before the disgust of those present was expressed. It was not surprising that this happened, when you think about it, because questions like those are generally put by Labour trolls and are generally felt to be extreme forms of victim-blaming and diversion.